The task of creating a chronological narrative of Jesus’ life and a topical arrangement of his lessons is a bit like trying to create one large jigsaw puzzle picture from four smaller jigsaw puzzle pictures. The subject is common to all four gospels—the life and lessons of Jesus—but the individual pieces from Matthew, Mark, Luke, and John don’t always fit snuggly together on one plane. Some stack on top of each other, creating a three-dimensional picture. And John concludes his gospel by mentioning there are many missing pieces in the written record of Jesus’ life. But ultimately, the pieces we have provide a consistent, multi-dimensional picture of Jesus. My goal is to simply provide a general story line of Jesus in the gospel writers’ own words and to categorize the actual words of Jesus by topics without any commentary or doctrinal bias. I trust this will be a helpful tool for seekers, new believers, and students of Jesus from all faith backgrounds as we sort through the pieces to get the big picture of Jesus’ life and lessons. Any text appearing in [brackets] is not in the World English Bible, but is to provide a transition or an explanation. 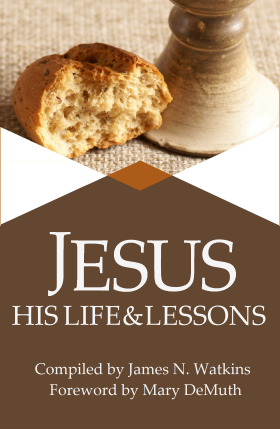 To learn about the process of compiling Jesus: His Life and Lessons, see Notes at the back of the book. Also, a Glossary is provided for unique words in the biblical text. I trust you will discover the God of love who “became human and made his home among us. He was full of unfailing love and faithfulness” (John 1:14). • Paper back Originally $14.99, now $12.99!